Creative professionals may think they do not need a resume when they go solo. After all, you’re not job-hunting anymore. But you are on the hunt for clients. I know many freelancers—including writers—that believe in this mindset. And they’re right in a way: You’re not a job-hunter anymore, so why have a resume? The truth is that as a freelance writer, you are a client-hunter; that is, you are always on the lookout for clients, right? And since many of them are companies that follow the traditional hiring model, which includes resumes, there is really no reason not to have one. While it may be more relevant for a copywriter securing corporate clients to have a resume, it can still be useful for journalists as well. Some writers maintain that they don’t need a resume, but what happens if someone is interested in your services and asks to see a resume? Is it worth it to miss out on what could be a cool opportunity simply because you’re “not corporate” or you’re “only indie” now? So, how can you put a resume together that adheres to the latest standards and lets your individuality shine through? 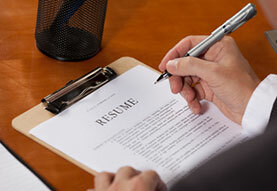 Here are a few tips for writing a winning resume. Ditch the objective. Nowadays, these only are used for recent graduates with little experience. So instead of an objective, use a profile or overview of your skills. A profile is similar to the objective in that you target the specific role you have your eye on, but you talk about what you have to offer instead of what you want. Get descriptive. In the profile, I start each sentence with an adjective. Take a peek at my resume for an example. Innovative copywriter generating sales-boosting marketing collateral that enhances organizational image and cultivates sales. Articulate leader collaborating with clients to devise brochures, website content, sales letters, and newsletters. Detail-oriented editor with exceptional command of the English language; leveraging AMA, AP and Chicago styles to maintain editorial consistency. Esteemed creative professional advancing thriving profession as an author and journalist. Use third-person. A resume should never be written in first-person tone…no matter how unique you are. Use the third-person tone—it sells you better and it’s the standard practice. You may be creative as they come, but a resume that starts with “I am…” shows that you do not understand the norms, and it has the potential to dissuade a corporate client that is looking for someone with a professional image as their outsourced writer. Tell your story. Skills-based resumes that lump your experiences together based on your aptitudes are nice, but your profile already tells about your capabilities as they pertain to what you want to do. Let the professional experience tell a chronological story so a client or employer can see how you’ve evolved as a professional. Even if you’ve got some experience that doesn’t relate to your career as a writer, the aptitudes you have gained in previous roles can still position you to thrive as a creative professional. Let’s say you have tons of smaller projects to highlight or maybe some gaps in time—you can still present them under a title of your own business, and use bullets to talk about some of the jobs. Use bullets to break up some of the text; I use set apart achievements with bullet points instead of having job duties and bullet points in either a paragraph or a bulleted list. Drop names. A lot of creatives I hear from say that throwing in names of clients makes them feel shallow, but it’s just good self-promotion—and you’re in business for yourself now, so you have to do everything you can to stay there. A Fortune 500 company may want to hire the writer that has worked with a fellow Fortune 500 business as compared to a writer that has only worked for local mom-and-pop stores or only focuses on publishing achievements. If the resume reader sees you’ve worked for a brand they know, they may be more impressed and maybe more likely to hire you. Be authentic. Be professional and genuine at the same time. Your resume doesn’t have to be dripping with formal words, but it can still be professional. After all, your resume is a marketing document but it can still show your talents as a creative professional. Kristen Fischer is a Certified Professional Resume Writer (CPRW). 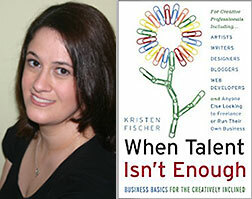 Her book When Talent Isn’t Enough: Business Basics for the Creatively Inclined is due out in stores this month. Visit www.kristenfischer.com to learn more. This was good to review. I spent a couple of years as a career counselor at a college, and then directing a career center. But a writing resume is a whole new set of rules. I appreciate the tips. How should you handle a resume if, between your first job as a journalist and where you are now as a writer (president and CEO of your own business), you held a number of low-paying jobs? I think your best bet would be to lump it into one role (maybe "freelance writer") with details on some of the publications. That way you won't have a "gap." Don't Forget The Writing Budget! Have You Found Your Writing Specialty?